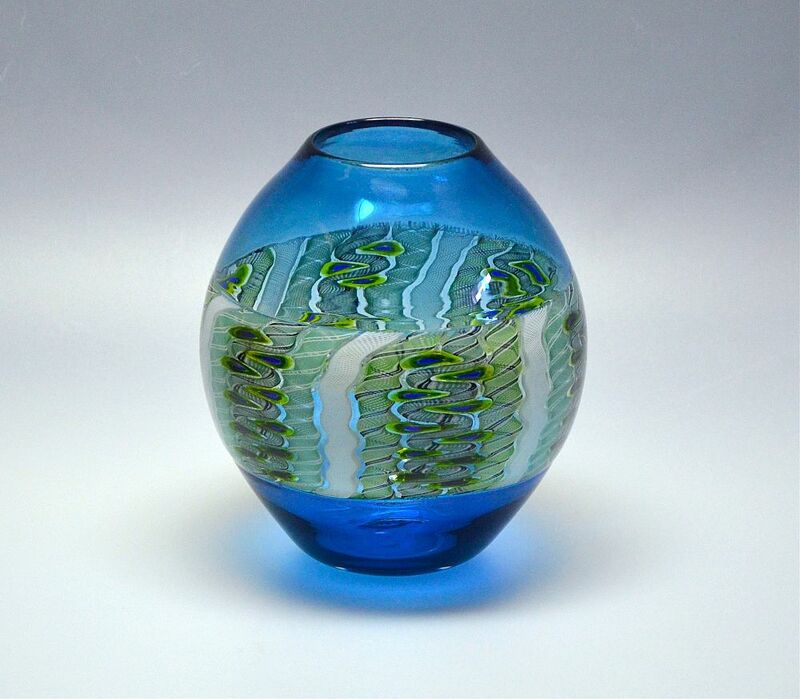 This gorgeous vase was made by Michael Hunter for Twists Glass in 2016. The top and bottom incalmo layers are in a lovely dark turquoise whilst the middle incalmo layer is of zanfirico and murrine canes arranged in panels of turquoise white and black zanfirico canes with blue and green murrines alternating with panels of green white & black and turquoise black & white zanfirico canes with green & blue murrines, the alternating panels separated by white zanfirico canes. The base is scratch sign "M Hunter Twists 16 Weaver Incalmo" and has the Twists Glass studio label. The colour combination of this vase has a muted vibrancy that is just lovely.